THIS was the book that those of us following the autoimmune protocol diet have been waiting for for months. True, Sarah published The Paleo Approach first - a very detailed book all about the origins of autoimmune disease, how what you eat can affect it, and which foods are potential triggers for autoimmune symptoms and why. But THIS book was the one with all the recipes, which is what those on very restrictive diets crave. I bought mine, late one night, on my Kindle because I just couldn't wait any longer to get it delivered (I get impulsive like that, especially after 10pm). And my goodness was I pleasantly surprised. I thought there would just be recipes, and that The Paleo Approach would have been left to cover all the science/food trigger explanations, but I was really pleased to see the basics outlined here again too. There are lists on which foods you should eliminate in the first stages of the diet, with tips on which foods you might be able to reintroduce fine later on. 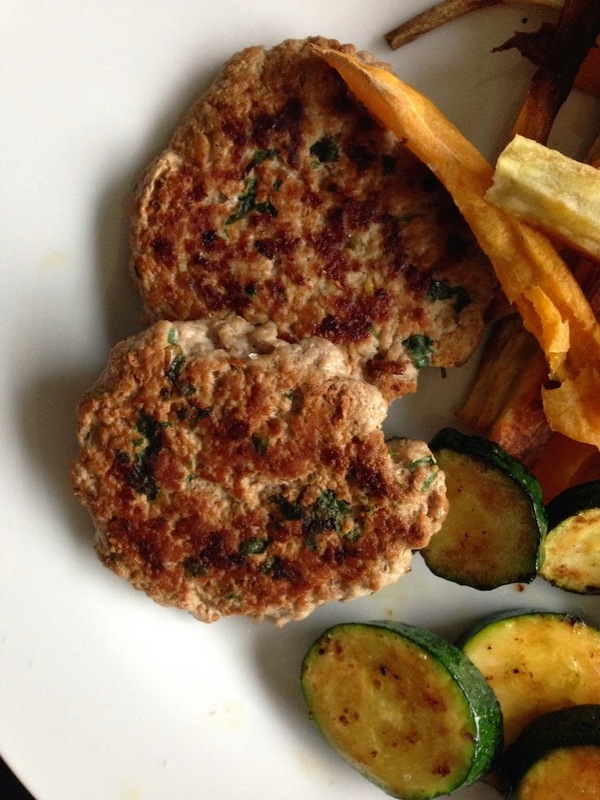 There are also suggestions on tweaking recipes for FODMAPs. Sarah even sets out menu plans (separate ones for you guys watching your FODMAPs) and gives a lot of tips on batch cooking, storage of foods and how to do paleo on a budget. It's really so much more than 'just' a cookbook. All the recipes in the book are suitable for the first stages of the diet. I chose a few recipes to cook, and found them easy to follow, straightforward and written as if Sarah's standing next to you in the kitchen as you read. I like that. The first job was to make the fresh fig jam, which Sarah serves with her bacon and bison liver pâté, but I chose to serve alongside my own pork and bacon pâté that was waiting for me in the fridge. 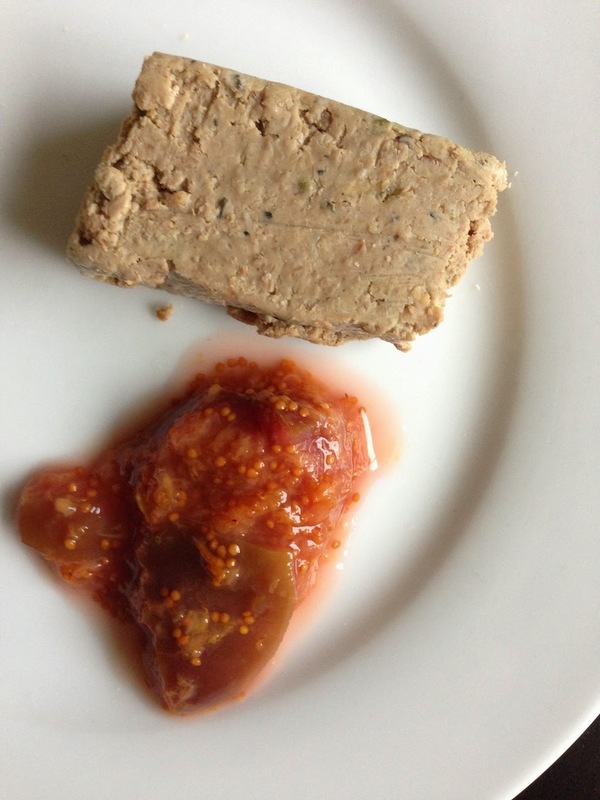 It was incredibly simple, and I used nice and ripe, sweet figs - but when I cooled the jam and served it the next day, I found it added a slight sweetness to the pâté - it wasn't as intensely rich as I thought it might be, in a dark, jammy way - it was actually quite light and took away the 'liver' flavour from the pâtè a little bit. Next, came the sardine salad. For the record, up until this point, I struggled to eat sardines, always preferring the less oily, sweeter mackerel instead. My husband spoons them out from the tin and I have to look away. I diligently chopped up salad bits, made the dressing and placed the salad on the table, for lunch. It was very green, with lumps of sardine in a lemony, crunchy dressing. 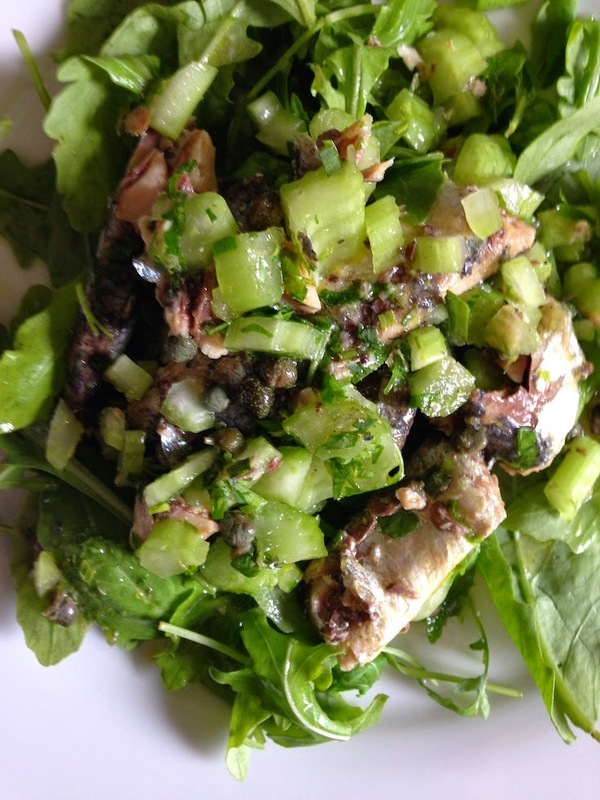 "Sardines are one of the most nutrient-dense foods you can eat," chirps Sarah from inside my Kindle, adding that they're "an outstanding source of the heart-healthy nutrient Coenzyme Q10." Well. We dug in. I honestly have never enjoyed a fishy salad as much as this one. Sardines are awesome. I've stocked up my shopping list. The lemon, tarragon and parsley all cut the oiliness of the fish - and because you have finely chopped celery in there too, it disguises the soft crunch you get from the bones. It's one of those dishes you eat and it really does feel that it's doing your body so much good. Brilliant. I moved on to dinner, which was the sweet Italian sausage. Sarah advises on using pork, but I could only get turkey - but I must say the little burgers I made using the mixture were gorgeous. We ate them with some sweet potato chips and pan-fried courgette (zucchini) slices. These would be my first choice to eat cold, on the go or at a picnic. I still have a lot more recipes to work my way through (there are over 150 recipes in the book) - but I can see that there are a lot of dishes here I'll be adding to the weekly rota. You can tell that this book has taken a huge amount of work to complete. It's thoughtful, realistic (with money-saving tips too) and a fantastic resource. I'll be recommending this to anyone wanting to start with AIP or paleo as it will give you such a head-start.